Current: How to save your money and fly with just your hand luggage! How to save your money and fly with just your hand luggage! If you’ve booked flights in the last, well, few years, you’ll know that on top of the cost of your flight, many airlines now charge you to check a bag into the hold – my recent experience with a budget airline saw the cost of a 20kg bag cost £50 EACH WAY!! Yes I know, the fares are cheap on budget flights for a reason (Oh my, do I know!) but whacking on an extra £100 surely negates the whole “budget” thing, doesn’t it?! Over the last three years, I have been to a wedding in Slovakia, a three day Hen Do in Ibiza, a girls weekend in Madrid and a cruise to Bruges – and I managed all of these trips with just my hand luggage bag. Yep, that’s right, just 10kgs of FREE luggage. There is much debate over the style of bag you should go for; should it be a hard shell on 4 wheels for convenience or your trusty sports holdall slung across your body? In the past, I would opt for a robust, wheelie device for the convenience and stability, but as you’ll quickly realise, when you discover the usual 10kg weight limit, a bag like this can greatly eat into your allowance. For this reason, opting for a soft case in the form of either a holdall, rucksack or a wheelie can save you valuable kgs! The newest bags on the market can weigh as little as 1.8kg, including a handle and two wheels! The other beauty of a soft case is that it’s a lot more giving – making it easier to store in the overhead lockers or under your seat (and squashed down further if need be!) It’s also handy to pick a bag that has external zip up pockets – they are perfect for storing your travel documents, phone, money, tablets and chargers, especially if the airline you fly with doesn’t allow a personal bag as well as a cabin bag! Regardless of how long you’ll be away, prior planning for what you need to take with you is paramount! This is where my habit for making lists never fails to come in handy. It’s really helpful to plan outfits around the activities you will be doing, rather than taking lots of options (I know I was rather guilty of this indecisive habit!) Creating a “capsule wardrobe” is a great option – pick a few statement essentials and then add a couple of extra pieces to create different outfits – works just as well for guys as it does us girls! As much as you think you might, you probably won’t need those 6 pairs of different shoes, so again, pick 3 pairs (including the ones you’ll wear on the plane) and stick to them! Remember to wear your heaviest shoes, along with heavy clothing such as jeans, coats and hoodies, to the airport, to ensure you make the most of your precious luggage allowance! Ah, the age old Fold vs. Roll debate! Personally, I do a bit of both, I stuff shoes with rolled up t-shirts and neatly fold my dresses in a bid to keep them flat, but I have recently discovered the wonder that are roll up travel bags! Similar to vacuum bags, except there is no need for a hoover – simply squeeze the air out of the bag as you roll / fold your items to create neat packages of clothes, taking up as less space than normal. Winning! If you do opt for folding, why not try stacking your items sideways, creating a row of easily selectable pieces? So the bulk of your luggage weight will stem from the cosmetic products you take – they deceivingly weigh more than you think. Firstly, think practically; do you need to take a pot of hair mask or 2 bottles of aftershave? Probably not! Before you pack, have a quick cull of the products and only take with you daily essentials – if you don’t use it on a day to day basis, you more than likely won’t use it whilst away! Secondly, decanter products such as shampoo, body wash and moisturiser into travel bottles rather than buying the products in travel size – you can pick up a selection of containers for as little as £1 – saving you space and money, see? And remember, most toothpaste tubes are already under the 100ml allowance, so there is no need at all to buy the travel size ones! Lastly, if you’re staying in a hotel, check to see if they already have a hairdryer in the room to save you taking one and consider whether you need to take the straighteners or electric razor – can you spend a week with wavy hair, use a disposable razor or embrace the face stubble, guys? I’m sure you can. “What do you do about a beach towel if the hotel doesn’t have a towel service? ?” Have a look online for “Travel Towels” – microfibre towels that fold up almost as flat as a t-shirt, whilst being light and super absorbent. 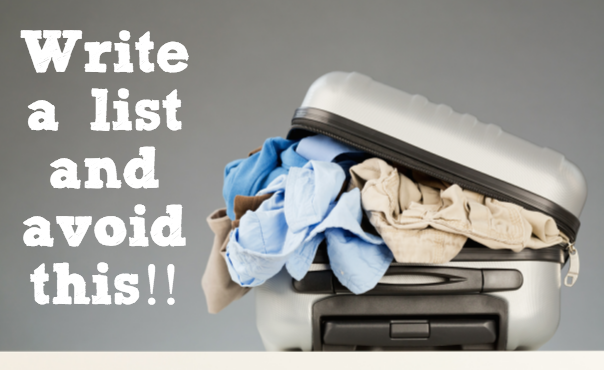 Folded up, it’d fit perfectly in the front pocket of your soft suitcase! It’s smart to be aware of the hand luggage restrictions for your flight, as these vary depending on the airline. Over the years, some airlines have relaxed a little, whilst some still enforce pretty strict regulations, often paired with hefty charges for over sized / heavy hand luggage! 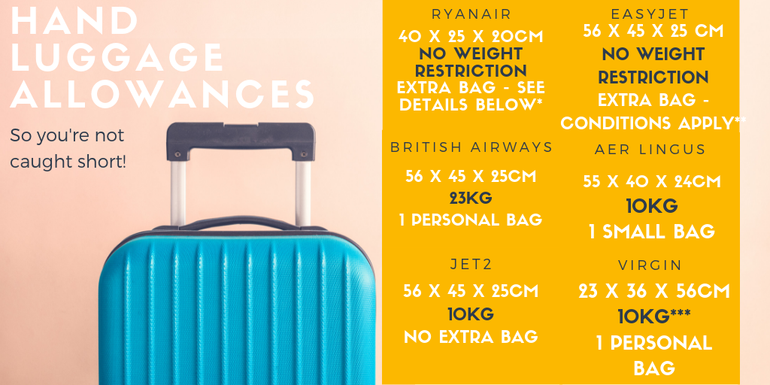 * As of November 2018, Ryanair have changed their hand baggage allowance. You can now ONLY take a bag measuring 40x20x25cm in the cabin with you for free and it must fit under the seat in front of you, but they don’t state a weight restriction on these. If you’d like to take a cabin bag on with you too, this is limited to a 10kg weight restriction and will cost from £6 each way as you’ll need to pay for Priority Boarding. Another option is to pay £10 and have your 10kg cabin bag stored in the hold with the rest of the hold luggage. **Please note however, that Easyjet only allow an additional bag for those travelling with an easyJet Plus, FLEXI fare, Upfront or Extra Legroom ticket – any other ticket holder will need to store their personal bags within their hand luggage – this is where having those additional pockets would be perfect! ***This is for passengers travelling in Economy or Premium Economy and is restricted to one bag only. If you are travelling Upper Class, you are able to take two bags with a combined weight of 16kg. 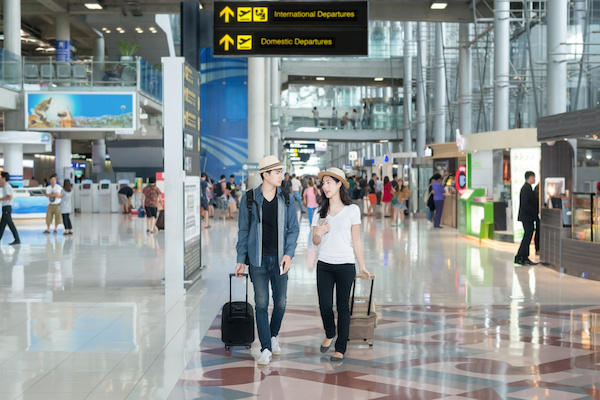 If you’ve got this far and are loving the idea of the money saving aspect of leaving your baggage at home, here’s three extra handy tips to really make up your mind. 1) You’ll notice throughout the airport several airlines provide carry-on size checkers – simply pop your bag into the checker and if it fits – it goes on! But hang on a moment, before you do that, lean in for an airport hack…. Place your case into the checker upside down – cases are usually narrowest at the top so should fit in more easily – you’re welcome! 2) Apparently colourful, ostentatious bags are more likely to be searched as they attract attention. Blend in with a classic black or grey case – just remember your signature luggage strap or scarf tied to the handle for identification in case it ends up in the hold! 3) If the bag looks heavy, you’re more likely to be stopped and have the bag weighed, which could be costly if you go over your 10kgs! Top tips to tackle this one is to avoid dragging a heavy holdall along the floor or placing it on one shoulder and stooping as you walk. Again, this is where the trusty soft case comes up trumps! I’m glad you found the article valuable, Brian, especially if it saves you some money the next time you fly! Excellent suggestions, will follow them this summer. Thanks. You’re most welcome, glad to have helped! I have been converted to Handluggage only for about 4 yrs now and find that my partner , my daughter , and myself can easily manage to pack enough for a weeks stay into the new , reduced size bag that Easyjet guarantee to carry on board . Just back from Crete I managed to pack , spare shoes, sandals, 5 tees, 5 regular shirts , 4 pairs of shorts, spare pare of long trousers and all the socks and underwear needed for 7 days , we have gone back to the old fashioned , bar of soap for showering , less risky than a shower gel leaking .I agree front pockets are invaluable. We watched a couple get taken out of line as their bags were too big, that had to then pay to have them stowed, an expense you don’t need on the last day of your holiday ! There are plans for Airlines to change the interior of their planes to accommodate more overhead storage as this is getting tight now as so many people travel this way . Another big boost is being able to waltz through the baggage area, straight out to the pick up, saves about 45 minutes at least and as we live only 25 mins from the airport, we are home while some people are still queuing for their luggage, makes me smile at the thought . Very true, thanks for pointing that out! All very useful tips, thank you. What is the make of the case with the front pocket please? There are plenty of options available on the internet, I’d suggest searching on Amazon for “Soft hand luggage bag” and there are lots to choose from! Opt for a case that is described as “superlite” to make sure it doesn’t eat into the weight allowance. I would love to try this, But the 100ml limit on toothpaste, body spay, ect, makes it a bit harder if you have to leave them out. I’m heading to Jamaica for 12days to an all inclusive,so hand luggage for me. The thought of too much unwanted items gives me chills. Great article,gave me the head nod I needed. Another little tip so you really don’t have to worry about those toiletries… Order your items on Boots online & set the delivery store to be the store that is air side at the airport. That way you are already through security before collecting them, so the 100ml limit doesn’t matter! Be careful with the ‘next day delivery’ promise though- they usually say to order a week in advance if ordering to an airport store. I do this every time I fly with hand luggage so my toiletries never eat into my allowance!